Spending time in a hospital as a patient is daunting, no matter what the reason. As a first time expectant mother, I had no clue what to pack and take with me to the hospital. The second time around, I knew things to leave at home and other items that were must haves. Then, when my little guy was only nine months old I stayed with him in the hospital for 4 long nights. It was during that stay, in February 2008, that I realized warm, clean socks were a must for me. The socks that they give you while there just do not cut it. Recently, I was contacted by PatientStyle to review and give feed back about their anti-microbial slipper socks. Since I love slipper socks and thought they would be nice to have when traveling away from home, I opted to participate. Patient Style sent me a pair of slipper socks – one mens and one womens. Going to the hospital is no time to start compromising comfort, quality or style. Patientstyle.com is the perfect place to find gifts for a loved one or yourself, whether you’re planning to welcome a new family member or caring for the ones you have. We’ve searched far and wide – and designed our own exclusive offerings – to bring you the best products out there in one convenient online store. From chic hospital gowns – front and back – to anti-microbial pillows and products, our site features the most useful, comfortable, and stylish items, designed specifically for what you or your loved one needs. Feeling better means healing faster, and our products make a significant difference when spending time within hospital walls or while healing at home. We received the men’s and women’s chenille lounge socks. They are enhanced with antimicrobial features and 99% polyester (1% spandex). When I first saw the pink socks, they reminded me of my favorite cozy slipper socks from when I was a child. They seemed really soft when I was petting them with my hands, but that was nothing compared to when I tried them on. The minute I put them on, I was in heaven. They were the softest things I have ever felt on my feet. They were warm, cozy and fabulous. As a person who battles the cold all winter, these are a welcome addition to my slipper sock collection to keep my tootsies warm. My husband has a hard time finding slipper socks. He has size 12 feet (wide width). Often, the socks we purchase from stores do not fit him. These socks were not too narrow and went up past his ankle properly. Score! I definitely think that these would make fabulous socks for patients that are in the hospital having a baby (wish I had these with me), having surgery or have a condition that requires frequent hospitalization. Of course, I also think they will be packed with me when I go stay at other people’s house or a hotel. The antimicrobial bonus will help to protect me from all of the nasty item that can be found not only outside of my home, but inside with two young children. My only wish is that they had some socks in smaller sizes for my boys. 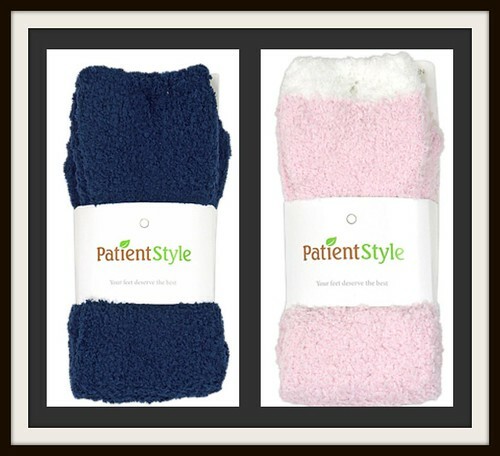 Thanks to PatientStyle, one lucky reader will be able to win their own pair of the antimicrobial chenille socks. MAIN RULE – Head over to the PatientStyle website and tell me one other item that you like. 1 Bonus Entry – Follow me on Twitter @TheAngelForever. Be sure to leave your Twitter ID. 1 Bonus Entry – Follow PatientStyle on Twitter @PatientStyle. Be sure to leave your Twitter ID. 1 Bonus Entry – Let me know who this pair of PatientStyle socks will be for. 1 Bonus Entry – Leave a comment on any of my non-giveaway posts from the month of December. Be sure to leave a comment here to let me know which one. You may only do this twice for this giveaway. To enter, please follow the rules above within the comment section. Contest starts today December 22nd and ends at 10:59 EST December 30, 2009. You do not have to be a blogger to enter, but must leave a valid e-mail address for me to contact you for mailing address once the giveaway is over. I will select the winner using random.org and contact you via e-mail. You will have 48 hours to claim the prize. If there is no response, another winner will be selected. Open to U.S. residents only. Disclosure: I received two pairs of the PatientStyle antimicrobial socks complimentary of PatientStyle in order to facilitate this review. No other compensations was given. The opinions expressed in the review are my own feelings about the product that I tried. Love the Women’s Candy Stripe Pajama! .-= Dina´s last blog ..Link Your Giveaways Saturday: 12/26 Edition =-. The socks would be for ME! Thanks to everyone that entered and to PatientStyle for sponsoring this giveaway. The winner will be notified shortly.